Investigators at the Virginia Tech Carilion Research Institute have invented a way to directly image biological structures at nanometer-resolution in their natural habitats (a liquid environment). The technique is a major advancement toward the ultimate goal of imaging biological processes in action at the atomic level. The technique uses two silicon-nitride microchips with windows etched in their centers and pressing them together until only a 150-nanometer space between them remains. 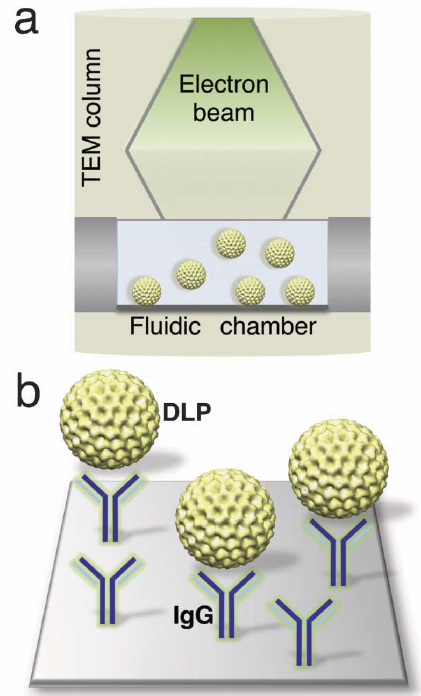 The researchers then fill this pocket with a liquid resembling the natural environment of the biological structure to be imaged, creating a microfluidic chamber. Then, because the movement of free-floating structures yield images with poor resolution, the researchers coat the microchip’s interior surface with a layer of natural biological tethers, such as antibodies, which naturally grab onto a virus and hold it in place. The ultimate goal is live electron-microscope imaging of molecular mechanisms, such as viral assembly pathways and viral entry into host cells. Read more: A high-resolution nanoscale window to the live biological world | KurzweilAI.